I kept hoping and hoping that I would get some germination and would have something to report. However, I guess it’s time to report what didn’t work. My gut feeling is that perhaps the seeds don’t store well, and since I waited until the winter rains started to plant (this has worked in the past for me), they may have died before planting. The other possibility is that the soaking time was far too long. 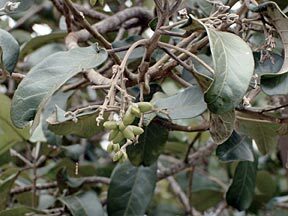 I soaked them for six days, since the U of H Manoa website I often use suggested that this worked for Melicope anisata. (The exact quote was, “Lilleeng-Rosenberger used a 6 day cold water soak as a seed pretreatment. These seeds took 6 months to germinate.”). I have never soaked seeds for this long. One to three days is what I usually do. I did change the water daily and kept a very low level of water in the containers. Last but not least, it’s possible they will still germinate (They’ve only been planted 2.5 months). I have Hibiscus brackenridgei seeds that are still germinating after three years.